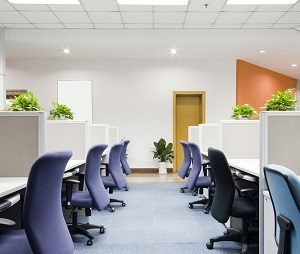 Many commercial properties in Severna Park can benefit from an acoustic ceiling tile installation from a reputable Severna Park painter. Acoustic ceilings are composed of tiles segmented in metal grids, and they function well in rooms and buildings with many hard surfaces and open spaces. Acoustic ceilings have been installed in commercial buildings such as hospitals, schools, studios, grocery stores, and offices. Along with their sound absorption capabilities, acoustic ceilings offer easy access to wires and pipes. If soundproofed walls are necessary in a building, acoustic ceilings are an excellent sound control option. Acoustic ceiling tiles are composed of materials such as foam, wood, cork, and tin. The tiles with the best soundproofing abilities are labeled with Ceiling Attenuation Class (CAC) and Noise Reduction Coefficient (NRC) ratings. Look for a CAC rating of 40 to 44 and an NRC of at least 80 percent. Many musicians and music producers have acoustic ceilings installed in their studios because of the tiles’ ability to diminish ambient noise. Your painter may recommend an acoustic ceiling because it will reflect light around the room, maximizing the impact of your lighting fixtures and preventing you from purchasing more lighting to brighten the space. Acoustic ceilings can be customized to suit any building’s interior. They can also imitate materials such as stucco, textured paint, or fabric. If your commercial building requires some remodeling, an acoustic ceiling is an attractive renovation that does not require demolition. Depending on your confidence level, you can tackle an acoustic ceiling installation yourself. However, if your acoustic ceiling design is complex, a Severna Park painter can complete the project quickly. The ceiling tiles are easy to replace and inexpensive to maintain and repair. Acoustic ceilings are fairly inexpensive, especially when you consider the immense value they provide. Installation, materials, and maintenance costs are all very reasonable. If installing an acoustic ceiling in your Severna Park commercial building appeals to you, reach out to an experienced painter at Annapolis Painting Services, and begin planning your remodeling project.